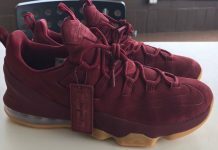 Within hours of unveiling the Nike LeBron 13 from Nike Basketball, we are now starting to see a few upcoming Nike LeBron 13 releases. Here is yet another one, but this pair goes with an Cleveland-like color scheme having dressed in a mixture of Grey tones, with Blue and White detailing. The entire upper features Grey mesh upper with a darker shade of Grey on the Hyperposite overlay. A shade of Light Blue hits the Nike Flywire cables, outline of the Nike Swoosh that is colored in White and sits atop a White midsole and same colored Blue tone on the outsole. One of the key highlights of the shoe is the hologram-like tongue. As of right now there is still no word on the background to this Nike LeBron 13, but they’re set to release on December 12th, 2015 at select Nike Basketball retail stores. The retail price tag is set at $200 USD. UPDATE: We now have a detailed look at the “Blue Lagoon” Nike LeBron 13 that will be debuting on December 12th at select Nike Basketball shops like Kicks USA. UPDATE: Here is another look via @zsneakerheadz at the Nike LeBron 13 “Blue Lagoon” that is currently set to release on December 12th.